The Iraqi Premier League (Arabic: الدوري العراقي الممتاز‎, translit. Dawri Al-Mumtaz) is the highest league in the league system of Iraqi football and currently contains the top 20 Iraqi football clubs. It is controlled by the Iraq Football Association (IFA) and is the top tier of an extensive pyramid-like structure, operating on a system of promotion and relegation with the Iraq Division One in which two teams get relegated and two teams get promoted each season. The league was formed in 1974 when the IFA replaced the four regional championships that existed at the time (the most notable of which being the Iraqi Central League) with the Iraqi National League (the first nationwide league of clubs in Iraq). The current format sees 20 teams playing 38 matches each (playing each team in the league twice, home and away), totalling 380 matches in the season. Of the 74 teams to have competed since the inception of the league in 1974, 11 have won the title: Al-Zawraa (14), Al-Quwa Al-Jawiya (6), Al-Talaba (5), Al-Shorta (5), Erbil (4), Al-Rasheed (3), Al-Minaa (1), Salahaddin (1), Al-Jaish (1), Duhok (1) and Naft Al-Wasat (1). The current champions are Al-Zawraa, who won the title in 2017–18. The logo of the Iraqi Central League. The Iraq Football Association was founded on 8 October 1948, and less than a month later, they founded a league competition for teams in central Iraq (i.e. the capital city of Baghdad) called the Iraqi Central League. They later founded three more league competitions, one each in Basra, Kirkuk and Mosul, and thus from 1948 to 1974, champions were only crowned at a regional level (expect for the one-off 1949 Iraq FA Championship that was won by Sharikat Naft Al-Basra). The teams that competed in each league were a mixture of football clubs and institute-representative teams. 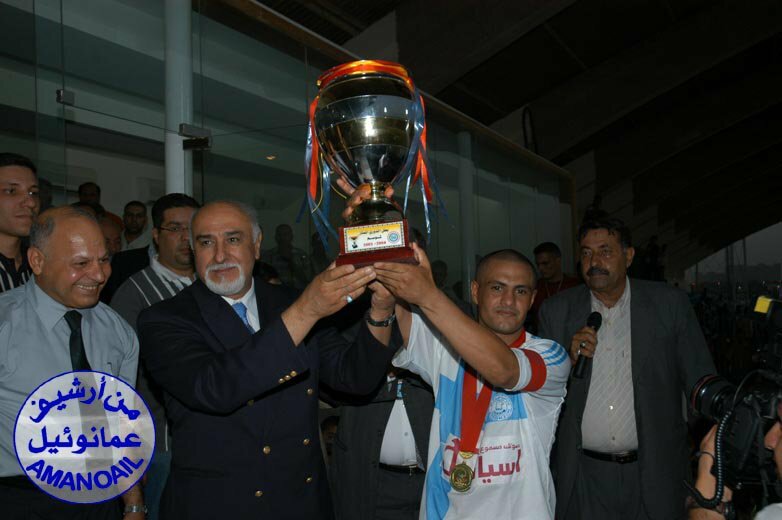 Despite being one of four regional championships, the winners of the Central League were considered by fans and the media to be the Iraqi champions, and the IFA selected the Central League winners to participate in the Asian Club Championship rather than winners of the other regional leagues. During its 26 seasons of existence, Haris Al-Maliki won seven titles, Al-Quwa Al-Jawiya won six titles, Amanat Baghdad and Al-Shorta each won five titles, Al-Athori and Al-Jaish each won one title and one season was abandoned midway through. After the success of the 1973–74 edition of the Iraqi Central League that included some teams from other provinces, the IFA made a decision that changed the course of Iraqi club football. During a meeting on 18 August 1974, they decided to abandon the regional leagues and replace them with a nationwide league of clubs: the Iraqi National League, as it was known then. This decision was initially met with strong opposition but was accepted over time as the IFA refused to return to the old system. The league held its first season in 1974–75 and was originally composed of ten clubs. The first ever Iraqi Premier League goal was scored by Falah Hassan of Al-Quwa Al-Jawiya in a 1–1 draw with Al-Sinaa. The ten inaugural members of the new league were Al-Tayaran (now called Al-Quwa Al-Jawiya), Al-Shorta, Al-Naqil, Al-Samawa, Al-Jaish, Babil, Al-Baladiyat (now called Amanat Baghdad), Al-Rafidain, Al-Sinaa and Al-Muwasalat (now called Al-Minaa), and the league was won by Al-Quwa Al-Jawiya. In the 1984–85 season, three points were awarded for a win for the first time, but this was changed back to two points for the following season. In the 1986–87 season, each team played each other four times in a quadruple round-robin format; this is the only time that this has happened in the league's history. The first time that the Iraqi Premier League was not held in a round-robin format was when it was split into four regional groups in the 1988–89 season, which were followed by another group stage, semi-finals, a third place match and a final. During this season, if a match ended in a draw, it would go to extra time and then penalties if necessary. A team would earn three points if they won a game by two goals or more (after normal or extra time). They would earn two points if they won a game by just one goal (after normal or extra time), and they would gain one point for winning a penalty shootout. Al-Rasheed won the league this season by beating Al-Talaba on penalties in the final. The 1992–93 Iraqi National League saw each team play a huge 69 games as each team played each other three times, meaning that a total of 828 games were played in that season. Each player was only allowed to play 46 games in the season. In the 1994–95 season, three points were awarded to a winning team as opposed to two, but four points were awarded to a team that won a game by three goals or more in order to encourage attacking football. Every season after this has seen three points awarded for a victory. The 2000–01 Iraqi Elite League started with a qualifying round to decide which 16 teams would qualify for the league competition. 135 teams in total from all around Iraq competed in the qualifiers; for the first qualifying round they were split into various groups based on geographical position and the top-finishing teams from each group qualified for second qualifying round which consisted of more geographically based groups. The top-finishing teams of those groups qualified to the league which itself was a 30-round competition. This led to the season being a lot longer than previous seasons, forcing the 2000–01 edition of the Iraq FA Cup to be cancelled. The league had been played in a round-robin format from 1989 until 2003, but after the US invasion of Iraq in 2003, the IFA decided to change the league system into a system consisting of group stages, drawn based on geographical position. This was to make travel easier for the clubs. The group stage system remained in place from 2003–04 up until 2010–11, and the double round-robin system returned in the 2011–12 season. It lasted for only three seasons until the group stage format returned from the 2014–15 campaign, but the double round-robin format was once again reintroduced in 2016–17. The Iraqi Premier League shield that was awarded to 2012–13 champions Al-Shorta. The Iraqi Premier League trophy was designed by Iraq Football Association member Zuhair Nadhum and the design was implemented by Qahtan Salim. The materials used to make the trophy were imported from China. The trophy is a flat shield, predominantly golden in colour. In the centre of the shield is a football made from gold and mirrored pieces, with a gold map of Iraq in the centre of the ball. Inside the golden map reads the word Iraq in Arabic, with the words Premier League Shield underneath (also in Arabic) completed with the season. Surrounding the golden football are the words Iraq Football Association written in Arabic at the top and in English at the bottom in silver text. Surrounding that text is another ring, the top half of which contains the Flag of Iraq and the bottom half of which contains 18 golden stars, representing the 18 provinces of Iraq (not including Halabja). Connecting the two halves of the outer ring on both sides is the logo of the Iraq Football Association. In seasons where the league is sponsored, these two IFA logos are replaced by the logo of the league's sponsor(s). Since the 2014–15 season, the shield has been surrounded by a circular wooden frame. This shield was first used as the Iraqi Premier League's trophy in the 2009–10 season. Prior to that, the trophy had been frequently changed. During the 1990s, the trophy was a golden shield with a photograph of Saddam Hussein in the centre, while the trophy was a flat silver shield in the 2001–02 season, a silver trophy in the 2004–05 season and a different golden trophy in each season up until the 2009–10 campaign. Ever since the Iraqi Premier League began, it has been dominated by the four biggest clubs in Baghdad: Al-Shorta, Al-Quwa Al-Jawiya, Al-Zawraa and Al-Talaba, who together contest the Baghdad Derby matches. Of the four teams, Al-Quwa Al-Jawiya have earned more top-four finishes (33) than any other side over the 42 completed seasons, meanwhile Al-Zawraa have won the league title 14 times, far more than any of the other sides. Al-Shorta have retained the league more recently than any of the other three teams having been crowned champions in both the 2012–13 and 2013–14 seasons, and Al-Talaba are the most recent team to have won the Double (Premier League and FA Cup) which they achieved in 2001–02. From the 1989–90 season until the 2005–06 season, the league was won by one of the four Baghdad teams every single time and this was the greatest period of dominance that the four clubs enjoyed. Even before and after this period, the league title was usually won by one the clubs. After the 2003 US invasion of Iraq, players started to leave the Baghdad-based clubs and join clubs in the North such as Erbil and Duhok in order to escape the danger of the capital city. This led to a shift in the structure of the "Big Four" and Erbil won the league three times in a row between 2007 and 2009 with Duhok winning the league in 2010. In the 2008–09 season, none of Baghdad's Big Four clubs finished in the top four and this is the only time that this has ever happened in the history of the league; the top four spots were occupied by Erbil, Al-Najaf, Duhok and Amanat Baghdad. Baghdad's Big Four have returned to dominating the league in recent seasons though, winning five out of the last six league titles. In total, Baghdad's Big Four clubs have won 30 of the 42 Iraqi Premier League titles in history. There are 20 clubs in the Iraqi Premier League. During the course of a season each club plays the others twice (a double round-robin system), once at their home stadium and once at that of their opponents, for a total of 38 games (however, all matches between Baghdad's Big Four clubs are played at the neutral venue of Al-Shaab Stadium to accommodate more spectators). Teams receive three points for a win and one point for a draw. No points are awarded for a loss. Teams are ranked by total points, then goal difference, and then goals scored. If still equal, teams are deemed to occupy the same position. If there is a tie for the championship, for relegation, or for qualification to other competitions, a play-off match at a neutral venue decides rank. The two lowest-placed teams are relegated into the Iraq Division One, and the top two teams from the Iraq Division One are promoted in their place. Each club is allowed a maximum of three foreign players in their squad. The winners of the league qualify for the Iraqi Super Cup, a match played against the winners of the Iraq FA Cup (if the league winners also win the Iraq FA Cup, they play the league runners-up instead). At present, the winners of the Iraqi Premier League qualify for the AFC Champions League group stage and the runners-up qualify for the AFC Champions League qualifying play-off. Collectively, Iraqi clubs have reached thirteen finals of major continental club competitions. Al-Shorta were the first team to do so when they reached the Asian Club Championship final in 1971, defeating holders Taj Tehran 2–0 in the semis. They were set to face Maccabi Tel Aviv in the final but refused to play the game in protest at the Israeli occupation of Palestine; the club itself as well as the entire Arab media considers Al-Shorta to the champions of the tournament after the subsequent expulsion of Israel from the Asian Football Confederation. Eleven years later, Al-Shorta were successful in another continental tournament, winning the Arab Club Champions Cup in 1982 by defeating Al-Nejmeh 4–2 on aggregate in the final. Meanwhile, Al-Rasheed won the Arab Club Champions Cup three times in a row in 1985, 1986 and 1987. Al-Rasheed also became the second Iraqi team to reach the final of the Asian Club Championship in 1989 but they lost a two-legged final on away goals to Al-Saad of Qatar. Al-Talaba reached the final of the 1995 Asian Cup Winners' Cup but they lost it 2–1 to Bellmare Hiratsuka, and five years later, Al-Zawraa lost the final of the same competition 1–0 to Shimizu S-Pulse in 2000. Erbil reached the final of Asia's second-tier tournament, the AFC Cup, twice (in 2012 and 2014) but lost both times (to Al-Kuwait and Al-Qadsia respectively). Al-Quwa Al-Jawiya finally ended the succession of defeats two years later when they edged past Indian club Bengaluru FC 1–0 in the 2016 AFC Cup Final, and they won the competition for the second consecutive season in 2017 by beating FC Istiklol by the same scoreline. They earned a record third AFC Cup title in a row with a 2–0 defeat of Altyn Asyr in 2018. The Iraqi Premier League has been sponsored by two different companies: Asia Cell and Fuchs Petrolub. 74 teams have taken part in the Iraqi Premier League since its first season in 1974–75 up until the 2018–19 season. The teams in bold are competing in the Iraqi Premier League in the 2018–19 season. Al-Quwa Al-Jawiya and Al-Shorta are the only teams to have played in every single one of the 45 Iraqi Premier League seasons. ^ The Iraq Youth Team played the second half of the 1990–91 season to accommodate for the withdrawals of Al-Jaish, Al-Bahri and Erbil. They also played the first half of the 1993–94 season but were then replaced by Babil who adopted the youth team's record. The following 20 clubs are competing in the Iraqi Premier League during the 2018–19 season. Smallest title-winning margin: 0 points, 0 GD and 2 wins – 1980–81 (11 games); Al-Talaba (8 wins) over Al-Shorta (6 wins). Both finished on 17 points and +14 goal difference, but Al-Talaba won the title due to having won two more games than Al-Shorta. Nashat Akram won two Iraqi Premier League titles with Al-Shorta, first in 2002–03 and then in 2012–13 as captain. ^ Not counting goals from annulled matches. ^ "The Iraq Football Association reveals the league shield for the 2012–13 season with materials imported from China". Goal.com (in Arabic). September 3, 2013. ^ "League shield for the 1997–98 season". Al-Shorta SC Website. April 30, 2017. ^ "League shield for the 2001–02 season". Soccer Iraq. December 29, 2016. ^ "League trophy for the 2004–05 season". Soccer Iraq. April 22, 2017. ^ "League trophy for the 2007–08 season". GettyImages. April 30, 2017.